What would you do if a Kitsune blesses your life with a cute girl who does all sorts of things for you? Nakano’s life isn’t the easiest. He works long hours, even in weekends, and so isn’t very happy with his life. He often comes home dead tired and would rather just not continue with stuff. But his life is about to change. The fox gods have spotted him and his super portion of anxiety, and are here to help him. Meet Senko, a tiny little girl. Well, that is how she looks, actually she is 800 years old. Not that it helps the situation, and I had a laugh at Nakano’s reaction. Switching between curiosity and hesitancy and being worried about going to jail if someone found out. Which I can understand. Senko still looks like she is about 9 years old. 😛 You don’t want to give people the idea that you like little girls. He doesn’t want to go to jail. But you can imagine that throwing her out of the house doesn’t help, hello, she is a God. Plus she can use some great tactics including tearing up and looking like a lost puppy. And that is how their daily lives begin. Nakano goes to work, while Senko stays at home and does all sorts of things for her dear. So when Nakano comes home, he can just relax, and if he is lucky can touch Senko’s tail (or ears). He quite like doing that, even if he feels a bit wrong about it. There seems to be more to Senko and Nakano then meets the eye at first. Because during a few moments we see both of them having flashbacks to the past. Did they meet up before? What was their relationship then? Lovers? I definitely want to know more and hope that the next volumes will tell us more. I loved Senko. Especially seeing her discover all the things that the modern world has to offer. From evil vacuum cleaners (she reacts the same as cats do to the noise) to air cons that don’t seem to listen to a God. It was absolutely brilliant. Also she discovers fried tofu comes in packages, and handy God feature (especially one of agriculture) she can feel if something is good value or not. I wish I had that skill when doing grocery shopping, would save me from buying rotten paprika (which you can’t see from the outside). Senko was just the sweetest, she cares so much for Nakano. We also have Nakano’s neighbour, a woman who apparently has either the key to Nakano’s home (or Nakano never locks his doors). When we met her at first I didn’t like her, but thanks to what Senko did I saw another side to her and now I am just laughing at her commenting at times on the noises she hears from them. The ending? Mmm, I am not too sure how I feel about the addition of yet another God. Especially as this one seems to be trouble. 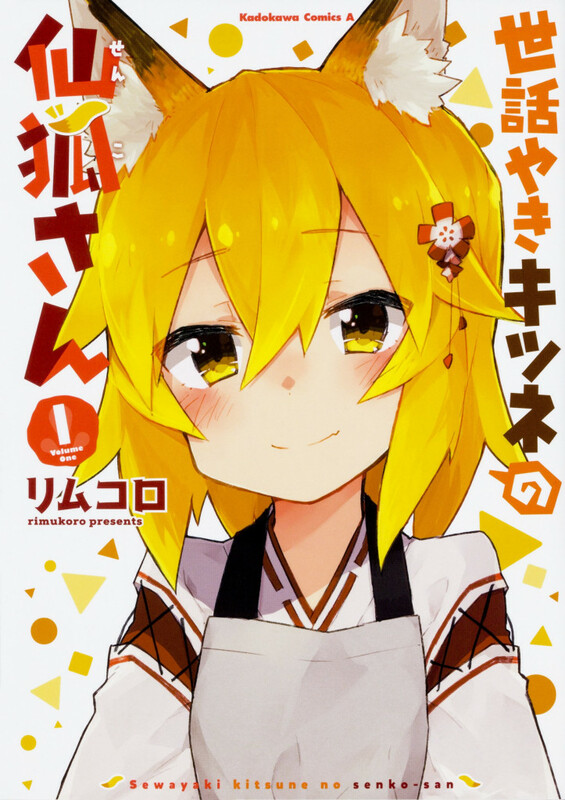 I wouldn’t mind if the whole manga would just be about Senko and Nakano’s daily lives. The art is pretty dang adorable. I love the way Senko (and the other Gods are drawn). Plus the mangaka really shows Nakano and his anxiety/tiredness (either by how Nakano looks or due to the dark swirls following him) really well and also shows that Senko is doing a fabulous job at trying to elevate his worries/anxiety (as you can see him look so much better). All in all, this is one series I want to keep reading, even with the addition of a new girl.